Streamline curriculum management and catalog production processes in one turnkey solution. Say goodbye to the paper chase! Move away from Word documents and PDFs with a fully digital solution. 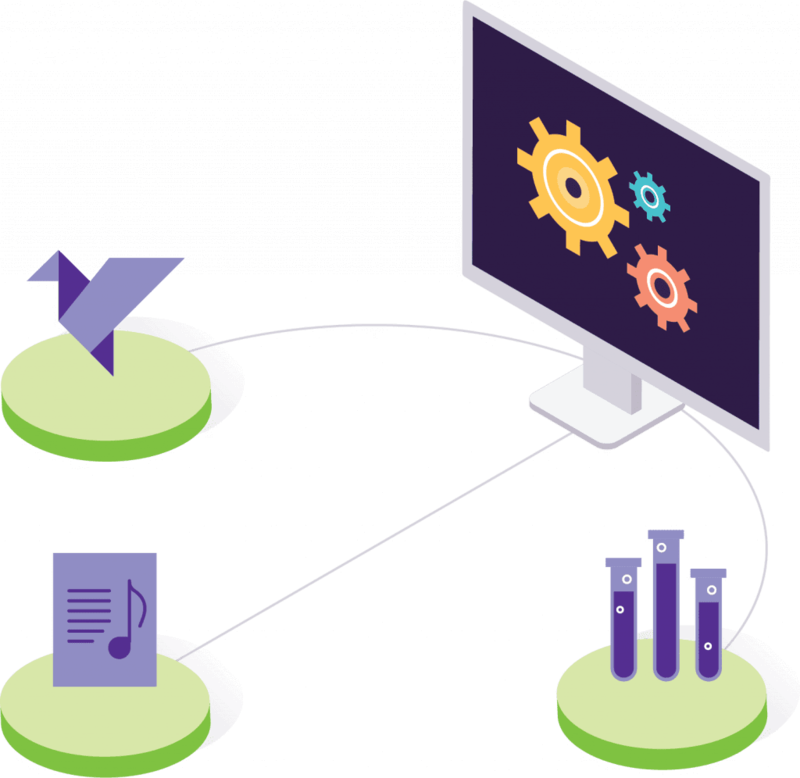 Workflows within SmartCatalog by Watermark support your curriculum approval processes, provide transparency to key stakeholders, capture document history, and ensure version control for catalogs and curriculum proposals. Easily update your print and online catalogs to reflect curriculum changes within one system. Gain efficiency and insight with digital processes that streamline catalog and curriculum management. No more pushing paper around campus and tracking down faculty to submit curriculum proposals. Support efficiency and collaboration with configurable workflows that ensure the right reviewers see the right proposals at the right time. Import your catalog into a central data repository with customized workflows that route content through the appropriate review process and keep a record of all changes. The result is faster approvals and easier publishing of your catalog. Create program maps, document general education requirements, and include suggested course sequences within your course catalog to help students succeed. Import existing student handbooks and policy manuals into the system, then use workflows customized to your institution to review these documents and publish updates quickly. Provide clear documentation of your curriculum review processes for accreditors with reports on curriculum changes, program requirements, user activities, and more. Easily populate online catalogs with course descriptions that reflect approved curriculum changes, program requirements, and links between pre-reqs and co-reqs. Create beautiful, custom catalogs that reflect your brand and academic programs. The flexible database makes it easy to publish your catalog online and in print and make real-time updates. 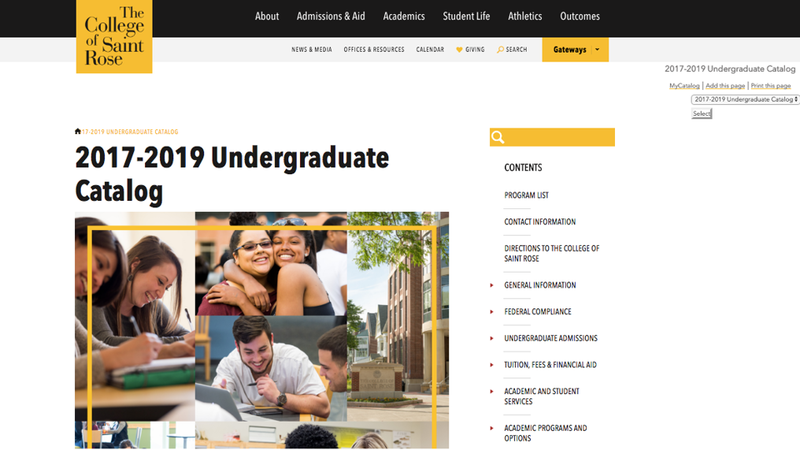 The result is faster, better catalogs that can be more easily accessed and searched by students, faculty, accreditors, and other community members. With SmartCatalog by Watermark, you can manage catalog and curriculum in a fully integrated, intuitive solution. Streamline review processes and capture the connections between course data, program requirements, and learning outcomes to inform changes for continuous improvement. 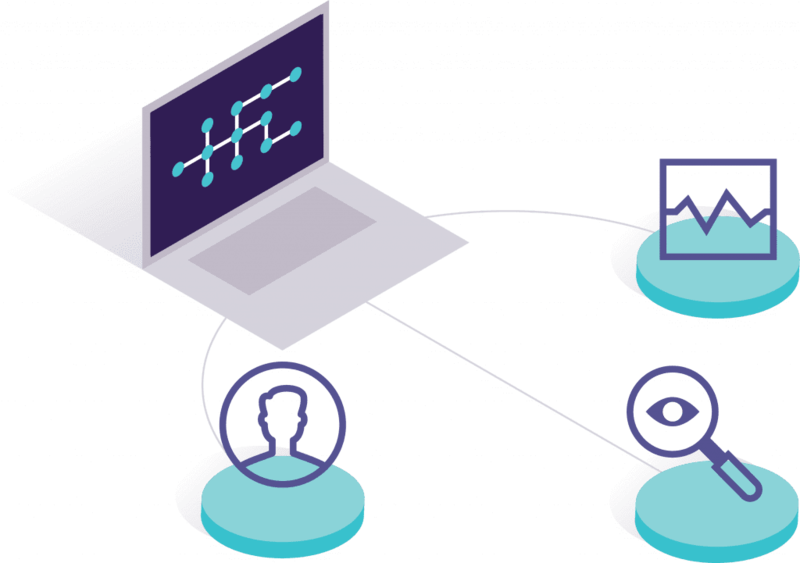 SmartCatalog learns your academic cycle and monitors your system to identify when you might need extra support, proactively deploying resources to help you meet your goals and timelines. "The entire campus loves your product. Those of us working with you, especially me, appreciate your customer service and your willingness to go above and beyond." 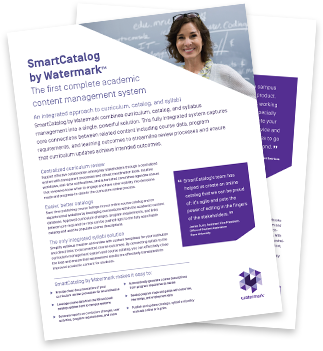 Learn more about how SmartCatalog can help you leave paper behind and simplify academic content management with better catalogs and more efficient curriculum review.